there was chance to check the vista to the south – yes, the Cardington Sheds are still there! The low water levels at the wide weir beside the lock show staining on the concrete from the more usual level of water flow. Cruising on past Danish Camp it was good to see that the outdoor bar is now up and running. “Queues at the counter are our greatest problem,” owner Gail had explained just a month before. In this hot summer the demand for drinks will surely be brisk… May the business continue to flourish. Onwards, the route still very familiar. But where was the expected fleet of boats at Great Barford? Just one boat was moored at the village green, none on the meadow. Just below Roxton Lock is the confluence with the little River Ivel. A surge of water as Cleddau left the lock revealed the silted sandbar at the Ivel’s mouth. One more lock on Wednesday, Eaton Socon Lock…. and queues both above and below the lock. Onward, Destination Godmanchester needed to be reached on Thursday for a rather special treat. First though came a ‘River Closed’ situation. Orange buoys connected by a line were strung across the river just north of Buckden Marina. The new southern sweep of the A14 is coming on apace. There were workers high up in a cherry picker cradle – were they just having an aerial lunch…? Within a few minutes a manned motor boat was used to haul the buoys out of the way. A second surprise came just minutes later. A steam driven whistle and a puff of smoke indicated a boat already in Brampton Lock, a rather good-looking home-built steam launch. Moored up in Godmanchester final treat arrangements were tweaked: Godmanchester Friend 1 was providing transport, picnic and tickets for a Cambridge Shakespeare Festival performance of ‘A Merchant of Venice’ at Downing College. The plays (eight in each Festival season) are performed outdoors in glorious college gardens. What could be more delightful than a civilised picnic to precede an evening’s fine entertainment?Theatrical trickery there was not, just the natural backdrop of a mature tree and a usefully large bush, the stage area being simply illuminated after the interval. A plain bench was the sole piece of stage furniture. With few other personal props being deployed Shylock’s weights and weighing scales reinforced the harsh cruelty of his intention to exact his pound of flesh. Though there was much audience mirth the serious themes were very apparent. What a grand way it was to spend a summer evening – many thanks, Nan. This was a First at Hemingford Lock when three coloured balls coming downstream turned out to be swimming capped heads. “Are there steps in there?” called the male swimmer. “Could we come in with you…” Up the three swam before climbing out at Cleddau’s stern. Clive Sinclair invented the pocket calculator. Yet the Scout Hut on Holt Island (right beside St Ives) refers to Cromwell District HQ. There’s a small museum in St Ives, the Norris Museum, so named after a locally born Huntingdonshire man, Herbert Norris. Like many Victorian gentlemen he loved collecting artefacts and curiosities. Among the many interesting displays is the history and practice of fen skating in these parts. Video footage of the 1963 winter is particularly interesting. On summer Sunday afternoons visiting bands play on the small square outside the Norris Museum. An appreciative audience lapped up the varied programme of light classical and film score music. The interval break was declared an Ice-cream Break – and the ice-cream seller whose van was cunningly parked nearby did phenomenally brisk business! and a wall painting on the Town Quay. a paddle boarder and several cruisers were afloat. By evening the quay was bathed in a rosy sunset. At last came Brownshills Staunch Lock, a stark site, between Holywell and Earith, industrial in appearance. The conveyors across the weir can be a distraction to the navigator. Weed is the problem on the Old West, bright green duckweed. It forms a sort of thick sludge across the water’s surface. The Old West is remote, the river map largely devoid of features and the stone supports are all that remain of the Aldreth Flat Bridge. Onward slowly,very slowly, just a gentle breeze whispering through the dark reeds. A flood embankment behind the overnight mooring at Aldreth High Bridge had to be climbed before darkness fell. Beyond are the flat parched fields and straight lines of fen country. Back on the river a swan family trod water by the bow, curious – or maybe just optimistic about some human generated crumbs. With temperatures rocketing Cleddau crept away early next morning from the other sleeping boats. The sky was cloudless, the green carpet even more dense. One hoot to indicate a right hand turn and two hoots for a left. 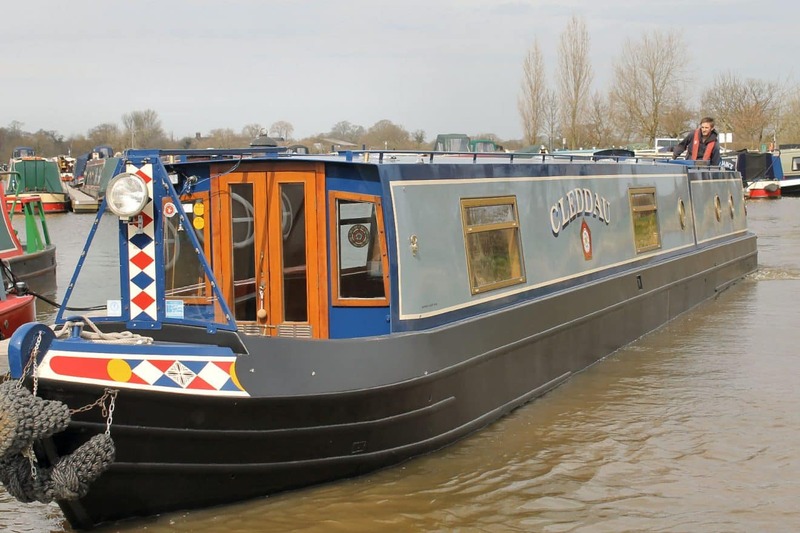 One hoot – and on Tuesday morning Cleddau turned onto brand new waters, heading south this time, up the River Cam to Cambridge.